Ever since I put my 1929 RK Saloon on the road I have regretted taking the rear axle apart as I am sure I have not adjusted it correctly and I have transmission noise which in my mind is unacceptable and very harsh. At least I know that the crown wheel and pinion are excellent and that all the old grease has been removed. Early axles ran on a mixture of oil and grease! However, I have done some research on the Internet and have found the following information which may be of use to anyone if their 'Seven' has a transmission noise. Whirring noise only while decelerating at any or all speeds is most likely caused by bad pinion bearings or loose pinion bearing preload, and almost never by bad crown wheel and pinion gears. A howl or whine during acceleration over a small or large speed range is usually caused by worn crown wheel and pinion gears or improper gear set up. Regular clunking every few feet may indicate broken crown wheel or pinion gears. A steady vibration that increases with the vehicle’s speed can be caused by worn u-joints or an out of balance propshaft. I have completely rebuilt the 3-speed gearbox, in the process found nothing which I could attribute the noise or the harshness although it now changes gear, particularly 1st and Reverse, a lot easier. I was also concerned that the propshaft seemed to be out of true, caused by the fabric coupling. Whilst I had the gearbox out I checked the diametric pitch of the holes in the fabric coupling to the pitch of the holes in the ‘spider’ coupling off of the back of the gearbox. The fabric coupling pitch was at nearly 2 mm larger in diameter, not much you may say but it meant that when the coupling was assembled onto the ‘spider’ the last stud was always the most difficult and the coupling was flexed to accommodate the error, this appeared to put the whole assembly out of balance. The cure, first check that the hole in the centre of the fabric coupling is concentric to the fixing holes, measure each hole from the nearest edge of the central cut out. If all is reasonably close, nothing is perfect !, then assemble three studs into the ‘spider’ coupling flange first, this is the opposite way of assembling the coupling than is normally used. Now lower the fabric towards the studs in the ‘spider’ lining up the centre hole in the fabric coupling with the machining marks on the ‘spider’ at the base of the arms. In this way keeping the two components fairly concentric. Having noted where the adjustment is need, use a round file to adjust each hole, checking frequently, until the fabric coupling will slide onto the studs without force. Once you have adjusted the first three holes repeat the process with the other three. The end result is a fabric coupling which is concentric with the output shaft from the gearbox and the propshaft, plus when you offer up the propshaft to the coupling it just slides on without all that thread damaging force that is previously evident. So now I have fixed the first two parts of my transmission, the third part is yet to be done, the back axle! 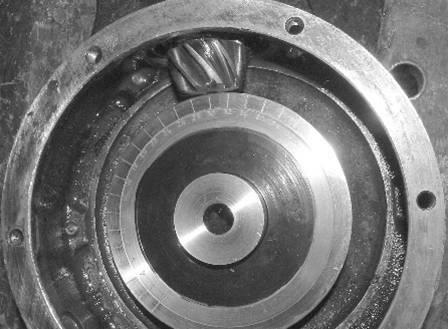 I have previously tried the ‘blueing’ method of setting up the Crown Wheel and pinion and found it very difficult to determine the correct pattern. Once you are ready to assemble the axle thoroughly clean ALL traces of oil and grease from the teeth of the crown wheel and pinion. This is most important as you need a clean surface to ensure the engineer’s blue goes on in a smooth even layer. You now ’blue’ the pinion and an area of the crown wheel, about a dozen teeth or so. Assemble the axle as if it is the final assembly, making sure the pinion is resting in the middle of the blued area of the crown wheel. Adjust the side to side adjusters so that the backlash is at a minimum. Rotate the pinion shaft backwards and forwards keeping pressure on the crown wheel, either by having an assistant holding the half-shafts where they exit the axle or by inserting a tool into the filler hole to bear on the outer surface of the crown wheel. The more you rotate the backwards and forwards the clearer the blueing marks should be. Now you nee to carefully take the axle apart an look at the markings on the teeth of the crown wheel and pinion. Where the teeth touch they do so with a sliding motion and there should be clear areas on the teeth. Typical patterns are shown below. If the marks look like this then clean off the teeth and fully assemble the axle, and adjust the side thrusts to reduce the backlash to the required minimum. However, it is likely that the markings will be like those shown below. The first set show that the pinion to too deep and the torque tube needs to be adjusted by moving it further away from the line of the axle, this is either done by screwing the tube out (early axles) or by adding shims to the coupling flange. If the pattern is similar to the following diagrams then the pinion needs to be moved into the axle by doing the opposite of the above. If like me you find it very difficult to see the marks to any degree of accuracy then there is a simpler way. Use an Pinion Gauge. Faced with the prospect of having to adjust my axle I have made a pinion adjustment gauge following the design of the original Austin gauge shown below which make the task of setting the axle a dream. All seems to be fine now that I have set up the pinion using the gauge It is much easier to be able to dial up a number and set the pinion rather than having to blue the teeth and reassemble the axle repeatedly after each adjustment. The picture shows the gauge in use in a ‘D’ type axle. My grateful thanks go to Ian Moorcraft, of the Bristol Austin Seven Club, for his assistance. This article, written by Malcolm Watts, originally appeared in CA7C Seven Focus Aug 2004 pp26-29.